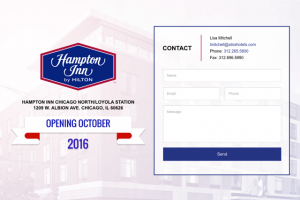 Guests can now visit the new Hampton Inn Loyola website. Although the website is temporary until the grand opening of the hotel (October 2016), guests can feel welcome to reach out to Atira’s Lisa Mitchell for any inquiries or questions regarding the upcoming hotel. © Atira Hotels. Web Design by The Ocean Agency.